EPDM, or rubber roofing systems, consist of three types of installations. Totally adhered membranes are glued to a mechanically attached insulation board. Mechanically attached membranes are screwed to the substrate insulation directly, while a ballasted system is loose laid and covered with rock. Rubber roofing continues to evolve with faster, better and more user-friendly components. The single biggest drawback for rubber roofs is the extremely low puncture resistance. Since warranties do not cover holes, extreme care must be taken so as to not damage the roof surface. Some buildings are simply not good candidates for rubber, requiring either a PVC membrane or a built-up membrane for high traffic areas. This system consists of rubber membrane roofing (45 or 60 mil thickness) that is essentially loose laid over substrate insulation. 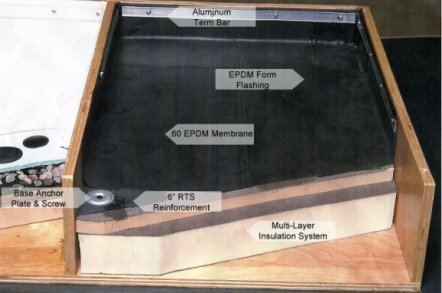 It is mechanically attached at the perimeter by way of a RTS (reinforced termination strip) anchored with screws and plates into the building structure. The loose laid membrane is then covered with river rock at a rate of approximately 10 pounds per square foot. The gravel keeps the membrane in place, as well as offering a small amount of protection from traffic. This system is the heaviest of all those available, and leaks within the field are very difficult to locate. This system is best for large expanses of roofing where access to the roof will be limited. This system consists of rubber membrane roofing (45 mil or 60 mil thickness) in roll widths of 7’ or 10’. Mechanical fasteners are installed into the structure at the roll edges, which are covered by the next succeeding roll. This system consists of rubber membrane roofing 45 mil, 60 mil or 90 mil that is glued directly to the substrate insulation. Mechanical fasteners are kept to a minimum, and no gravel ballast is necessary. This system is the best rubber system on the market. It works well for all applications, but becomes somewhat cost prohibitive on certain projects. Bear in mind that rubber roofing is prone to puncture and care must be taken even on a fully adhered system. If you would like more information please give us a call or contact us with any of your commercial or residential roofing services questions.